We’ve all heard a lot about “smart cities” and “responsive architecture,” by what about architecture that tells secrets? Murmur Wall, designed by Jason Kelly Johnson and Nataly Gattegno of the experimental design practice Future Cities Lab, does just that. The pair describes their site-specific installation at the main entrance to Yerba Buena Center for the Arts in San Francisco in as “artificially intelligent architecture.” “We are interested in exploring how data can become visceral, tangible, and poetic,” Johnson explained. “We’re experimenting with its potential to create meaning and a sense of place within the contemporary city.” Murmur Wall harvests local online activities—via search engines and social media—and broadcasts select phrases back into public space. 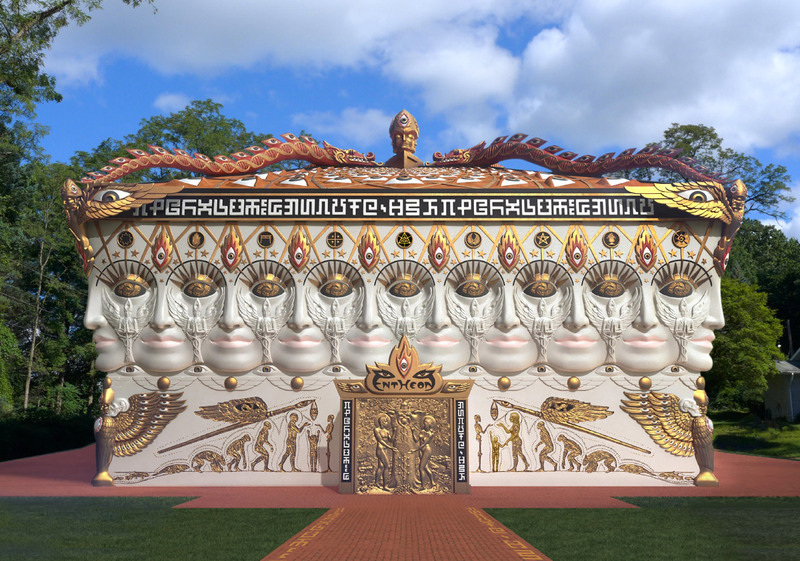 Visitors to the wall can also contribute anonymous secrets, rumors, and gossip to the wall at the website murmurwall.net. Unlike many interactive artworks that rely on screens to share information, the sculptural installation uses a steel tube armature and illuminated fiber optic rods. LED lights embedded in the acrylic tubes illuminate the stream of whispers along the length of the Murmur Wall. When the real-time data reaches the 3D printed “pods” embedded with LED display, the small, embedded screens display a brief text before the data continues on as a light stream. This integration of digital and architectural strategies comes from Future Cities Lab research and teaching practices. Both designers are faculty at the California College of the Arts where Gattegno is Chair of the CCA Graduate Architecture program and Johnson coordinates the CCA Digital Craft Lab. Their work embraces the booming tech culture all around them in the Bay Area and then grapples with potential architectural applications, finding solutions that go beyond smart city catchphrases. “There is a lot of talk these days about how the Internet of Things will make the city more efficient, informed, and productive,” said Johnson. “We are more interested in its potential to connect people, to help them share ideas and experiences, and create communities in the physical world.” Revealing secrets is the first step. The installation is open and accessible to the public 24/7 at the Mission Street entrance the museum. 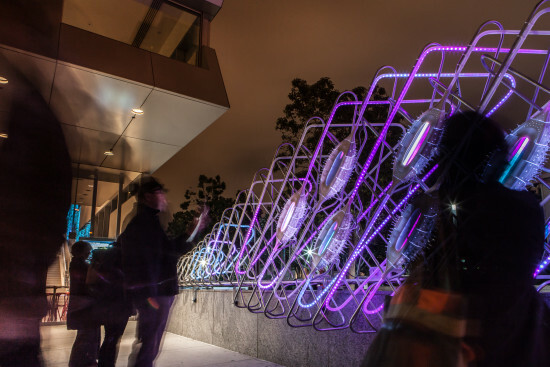 A second Future Cities Lab piece, Lightswarm from 2014, is on view on the south facade of YBCA’s Grand Lobby.